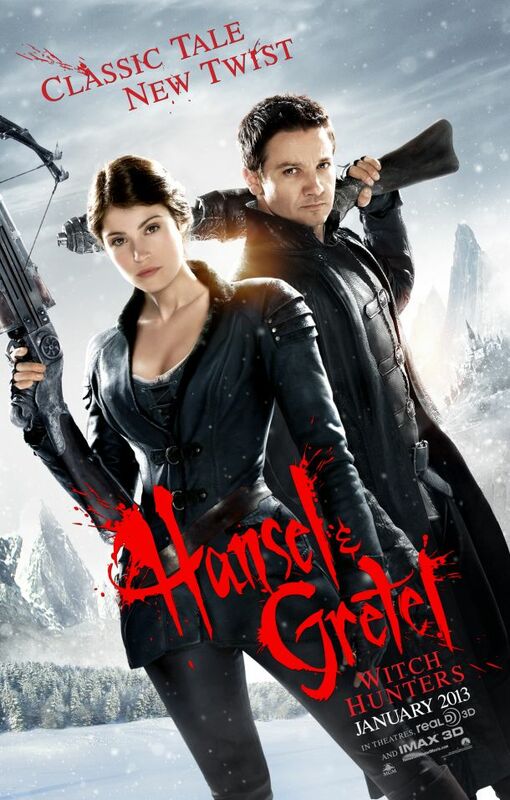 What it’s about: Hansel & Gretel are bounty hunters who track and kill witches all over the world. As the fabled Blood Moon approaches, the siblings encounter a new form of evil that might hold a secret to their past. Review: Now I can’t say I know too much about folktales and I’m not too familiar with the original story of Hansel and Gretal but I kept seeing the cover of this film every time I went on Netflix and after months of scrolling past it, I finally decided to watch it and my first reaction? Why the hell hadn’t I watched this sooner?! The fact Jeremy Renner is in it is a complete bonus for me as I’ve developed quite a crush on the actor recently. Some friends of mine, particularly Lynsey, will know how out of hand my celebrity obsessions can get! Anyway, along with Gemma Arterton they play the grown-up brother and sister, Hansel and Gretal who are now witch hunters. A flashback of their childhood, with them going into a house made of candy which they stumbled across in the woods provides the basis of the story and how they encountered their first witch. Now grown-up they protect their town from the threat of evil witches and find out a shocking discovery about their own family along the way. I really wasn’t sure what I’d think of this film but it turns out, it’s right up my street. The story-line, although one that may not appeal to some people, was compelling, interesting and full of action. There’s not a dull moment in the entire film. If you’re a fan of Fantasy then I think you’ll very much enjoy this as you won’t see any of your typical witches in pointy hats – the witches are weird, scary and a product of fantastic visual effects and make-up artists. In fact, despite what you may think, please don’t let your children watch this film! In addition to the scary witches there’s a lot of blood and gore, which really surprised me but it worked. Thinking back now, if there wasn’t, the film might have come across as a bit tacky. I enjoyed watching a film where the main relationship centres around a brother and sister as opposed to a romantic relationship. There’s a tiny aspect of romance in the film but it doesn’t over-do it and by no means take the attention away from the main story. I loved how Hansel and Gretal worked together and how much they believed in each other. I haven’t knowingly seen Gemma Arterton in anything else before but after seeing this and watching a few YouTube interviews, I am in love! Judging by Gemma’s previous roles, she tends to land a lot of ‘damsel in distress’ type parts but Gretal in the film is the complete opposite and her character is a force to be reckoned with. She’s smart, loyal and extremely brave – a ideal role model for girls to look up to. Oh, and the actress was born just an hour from where I live! If there’s one thing that Renner has proved to us he can do, it’s action so this role worked really well for him and both of them together made a fantastic duo. This film really did surprise me so don’t knock it until you’ve tried it. The effects were well put together but not overly flashy, the storyline doesn’t go off on unnecessary backstories and it was actually quite funny in parts. An interesting and different take on an old fairy tale but this one should be enjoyed without the kids. OH, totally watch Lost Boys! But, yes – I was completely surprised by this movie. I saw a lot of reviews who took it way too seriously and was like…Ummm… no. It’s just FUN! Chill out and laugh a little. Also, it was beautifully shot. Looking forward to the sequel. I’m losing faith in you Jenny! You chose to watch THIS over The Lost Boys?!! Are you insane?!!! Calm down judgy-wudgy, I watched this weeks ago before you even mentioned The Lost Boys! It wasn’t that bad! OK, I believe you. I will not let The Lost Boys lay though. Never!